Build report: Cloning the Estes Cineroc w/Astron Omega Launch Body. Well, after nearly 30 years, I've begun the process of building the rocket of my dreams. Ever since I first saw the Estes Cineroc/Astron Omega in my teacher's 1971 Estes Catalog, I've wanted one for myself. There's something about the lines of that rocket (complete with the fairing jutting out of the side of the payload section) that has held my imagination for decades. Despite not having a ogive nose cone, it just looks FAST!!! When I was doing some research for the 808 #16 camera, I somehow got caught a tangent thread of investigation, and found Boosterdude's SEMROC - Omega thread. If you haven't seen his rocket yet, I strongly recommend you take a look, he's done a sweet job of making this rocket. That is the rocket I'll be basing this build's external looks on. The internals will be a lot different from the original however. First, you have Semroc's slotted fins, and the variations of the centering rings. I'll be building my Omega with a ducted ejection system to eliminate the need for wadding, and I'll be going with the elastic shock cord rather than the kevlar shock cord, due to zippering fears. I've only zippered one rocket (a personal attempt at recreating the Estes Trident), and I'm not looking for a repeat of that mistake. I don't know yet If I'll be going with the option of using the original D Booster, D Upper engine combo, or an E to D, or E to E option. I'll wait for the kit to arrive (E to E has my interest, but I'll probably only launch D to D or E to D to to loss concerns). The Cineroc camera payload section will be replaced with the 808 #16 keychain camera. I also am planning on adding a sonic beacon (a cheap alarm for windows and doors), to improve my odds of recovery should the rocket get out of sight, and perhaps an LED light to help me find it if I have to go pluck it out of a tree at night. I will try my best to match the external look, but the guts will be a new beast entirely. So, until I get the kit and parts in my hands, You, and I will have to wait for updates. I hope to have this built in time for a launch during Dead Week/Finals. I've printed out the dimensional drawings of the camera, the Cineroc Operations Manual, and the 701-K-52P instructions. No, really what I'm really looking for is information on the decals. I'm going to make the Semroc Omega almost stock (externally at least), but I've got decals (Excelsior Rocketry) to make it match a 1970's Estes Cineroc/Omega. What I don't know is was there a special set of instructions/decals sent with the Cat. No. 701-RC-8 (Combination Offer). I've never managed to get a firm answer to this question... Did the RC-8 rocket body have only one of the black/blue decals, or did it come with two? Did it come with any bodytube decals at all? I've seen in some photos of an unboxed Omega that apparently some of the 701-K-52 (no payload section)/701-K-52P's (w/payload section) didn't come with any body tube decals. I'm also hunting for info on the 701-K-52's instructions. Were they different than the K-52P's and/or the RC-8's? If I don't get a firm, "This is how it was back then..." from someone who knows, I'll probably build the rocket with only one of the body tube decals (opposite of the LL) and one white on the camera body. For those who are looking to do this yourself, I'll be updating this with links to related threads and resources as I can. Classic Estes Cineroc/Astron Omega decal questions. Pick1e's mounting a keychain cam in a body tube. 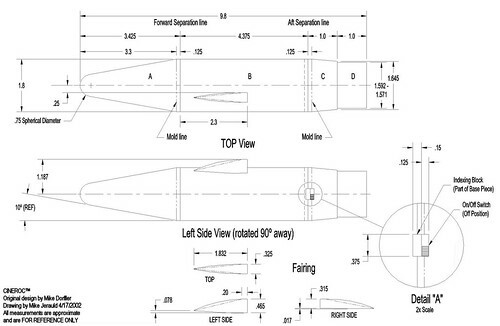 Dimensions of the original Estes fins from YORF post. Last edited by K'Tesh : 10-26-2016 at 08:18 AM. I've updated the original post with images, and the questions I have about the decals. Again, if you've built a 1970's Combination offer, I'd love to hear from you. 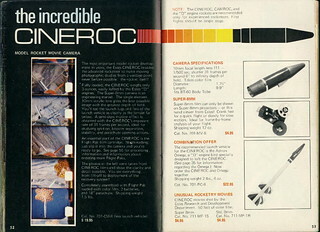 In the photo above the Cineroc camera is glossy black, and apparently so is the screw eye. I suspect Estes painted their Cineroc camera for that photo. I may be wrong, but in the photos I've seen of YORF's Earl's unboxing of the Cineroc, it's not quite got that high gloss look, I'm certain it was bare plastic. 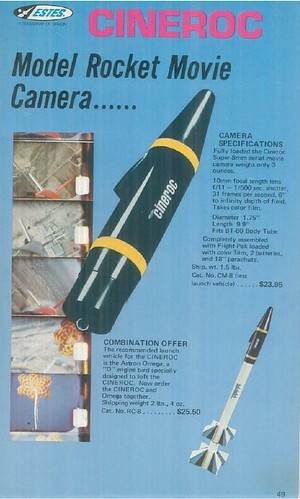 Also supporting this was the look of the camera in the 1970 catalog. That looks like bare plastic to me. So, the final decision on the model I will be making is... 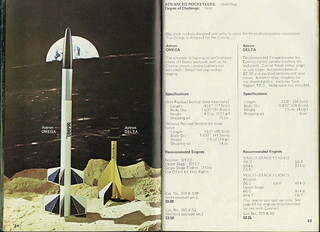 I will be making a copy of the 1974 Estes Catalog photo model. I wonder if anybody who bought one back in the day felt a slight disappointment that it wasn't so glossy as the photograph appeared. I know I would have been just a little. Oh, and another thing... I spotted the launch lugs in the 1970 catalog too. You don't see those to often in newer catalogs. Last edited by K'Tesh : 04-07-2013 at 12:35 PM. The main body of the camera is definitely a glossy black plastic. It is a different plastic than the nosecone or the base adapter. Those two sections are more of a matte finish plastic. NO pieces of the camera are painted....they are just their natural color of the plastic they are made from. Yes, I did notice that the nosecone and the adapter are not nearly as shiny as the catalog shows. 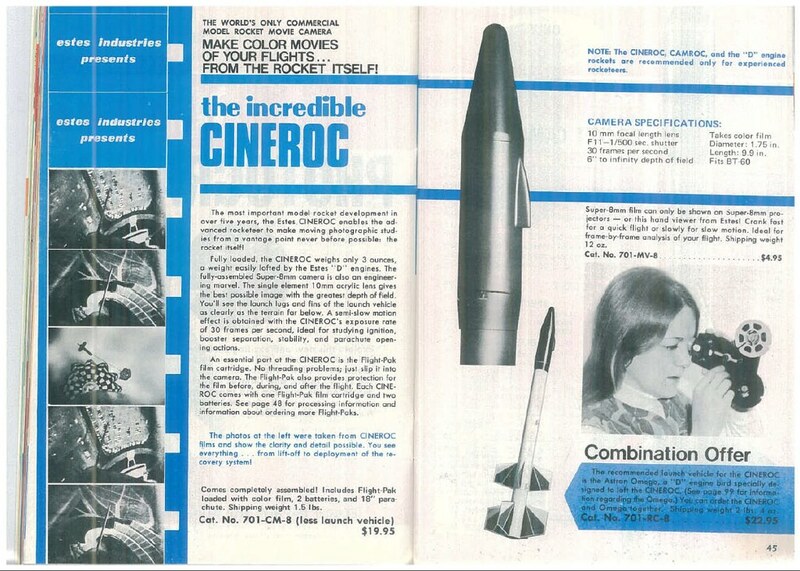 That catalog image you have posted looks like the one from the '76 catalog (my first Estes catalog) and the one that I too have in my mind when I think of Cineroc. They obviously 'spiffed' things up a bit for the catalog photo! Screw eye was also natural steel color.....no black paint. Scanned photo of tape strips added to the other thread. Good luck with the project. I'm currently in the primer and paint stage on my vintage Omega and will be hopefully working out final lab details for developing exposed film here in the next few months. Want to get at least a couple of Cineroc flights in the 'old fashioned way'. I've done video cameras and such many years ago during my high power days back in the late 80s and 90s, but always wanted to own and fly a Cineroc since way, way back when. Took me a few times re-reading that before I understood it. I thought for a moment that it was saying "No, pieces of the camera are painted", then I realized that you were saying something more like "None of the camera's pieces are painted". That screw eye was the tell. I've never seen a black screw eye included in any kits I've ever made that wasn't natural metal. To save people from jumping back and forth from thread to thread, I've boosted the image of the tape, and my reply from Earl's Thread . New question... does anybody know what the 1974 Estes parachutes looked like? Thanks! Last edited by K'Tesh : 04-07-2013 at 02:48 PM. On that tape - use the colored plastic decorating tape available in hardware stores (short rolls of various colors) instead of yellow electrical tape. The vinyl tape in those colored rolls is much closer to the original than stretchy yellow electrical tape. And you don't seal the switch port. You have to leave it open so you can start the camera prior to launch. You only have a few seconds, I don't think you're going to try and tape up the switch at the pad. And like others have mentioned the body plastic on the camera is glossy black whereas the adapter section and the nose cone are more matte. Do you have a product number in mind for that plastic decorative tape? Is it adhesive? When I think about that, mentally, I get a picture of the stuff that surveyors use to mark stakes and streamers are made of. Which of course, doesn't jive with my understanding about the kit. I'll have to carefully read through the operational manual to see if I can figure out what the 11/16" pieces are for (if anything). Kurt has been a wonderful fount of knowledge and experience for me in my Cineroc 'memories' quest, so you can depend on and trust what he has to say. I've not gotten to the flying stage with mine as of yet, but Kurt has a number of times, as well as others here on the forum. Also, on the Cineroc/Omega 'combo' offer from Estes, I don't know for certain but I suspect that 'combo' did NOT come with any special instructions or such. It was probably just the Cineroc in its box and the Omega in its respective kit bag, much like if you bought them separately. In other words, if you get the Omega instruction set and the Cineroc instruction manual, then you are probably not missing anything. However, if I have that assumption wrong, someone please correct me. Finally, on my vintage Omega build, the Omega rocket kit did NOT come with any 'Cineroc' decals. I want to get one of the black Cineroc decals to go on the Omega bodytube like they show in the catalog photo, but one did not come in my Omega kit (Gordy I assume can supply them). I don't know if the Omega ever came with any Cineroc decals. Again, if anyone has a different data point, please chime in. It is adhesive. The scan provided shows it attached to its backing paper. You can see that it is divided down the middle. One strip for the nosecone, the other strip for the adapter base.